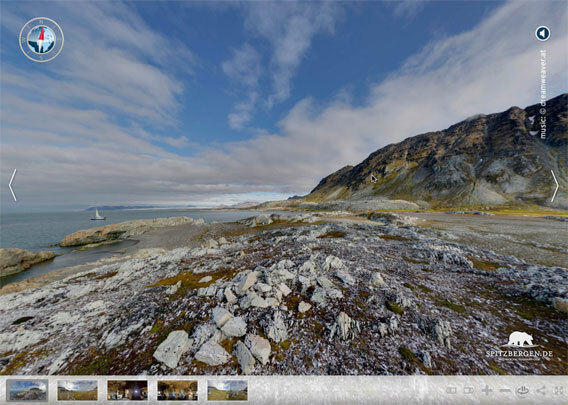 The bay Hyttevika is situated on the west coast of Spitsbergen, not far from Hornsund, just north of the entrance. It is reasonably protected from the open sea by the small islands of Dunøyane and a number of little islets and rocks further south. Many coastal rocks make this coastline very picturesque, but also a bit difficult to access. These are not Spitsbergen’s easiest waters for navigation. 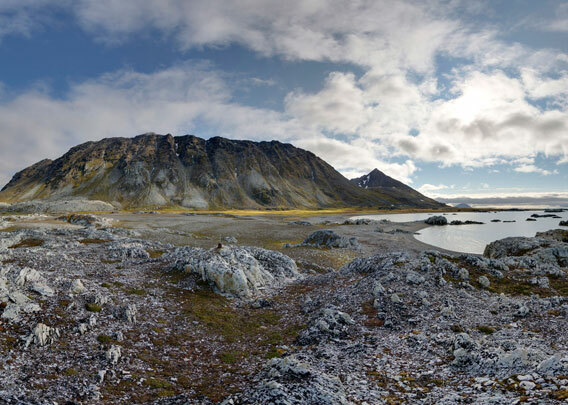 But Hyttevika is one of Spitsbergen’s most beautiful spots. A narrow coastal plain is stretching out between the shore and the rugged coastal mountains. This plain has many rocks, hills and lush green tundra. Little auks are breeding in large numbers under big rocks on the nearby mountain slopes. 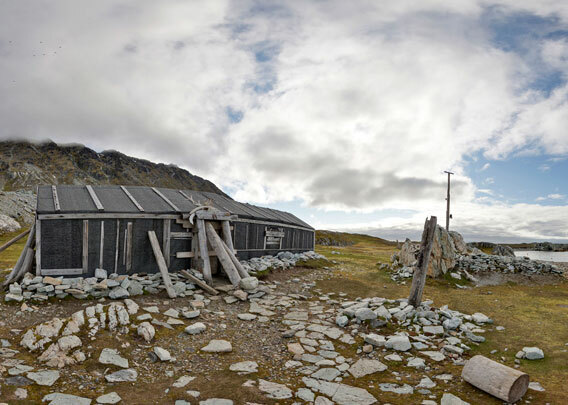 Claus Andersen from Tromsø built a hut in this scenic area in 1907. Because of all the drift ice that used to come from east Spitsbergen with the cold currents around Sørkapp (the south cape) and into Hornsund, the area had a very good reputation to be a good hunting district for polar bears. 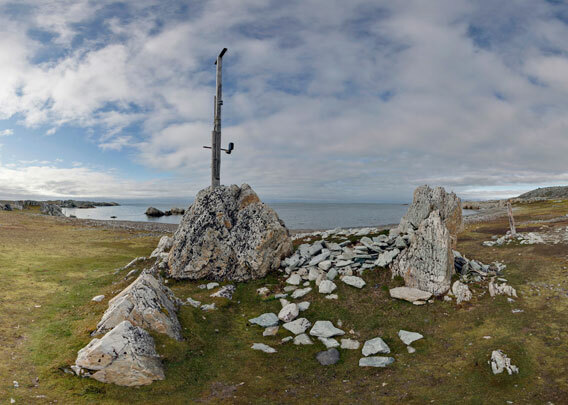 Hunters including Henry Rudi, who later became famous as isbjørnkongen (polar bear king), wintered here. The hut is relatively long. 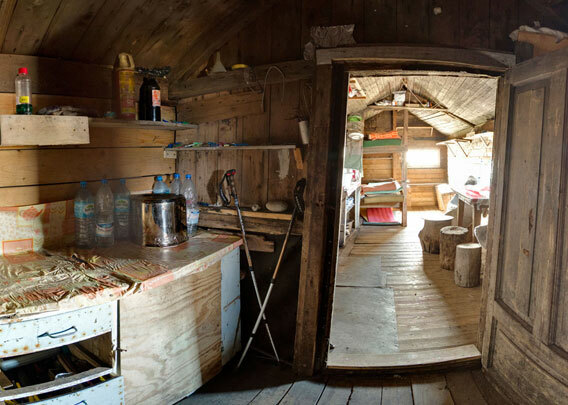 Being more than 100 years old, it is amongst Spitsbergen’s most beautiful trappers huts. It was substantially restored in 2016. The entrance hall gives access to a smaller room, used for sleeping and storage on the northern side, and to the main room, used for – well, everything. With 3 rooms, including the entrance, Hyttevika is relatively spacious. Nevertheless, space was always tight, considering that equipment and supplies for a whole year needed to be stored. It was especially lively in Hyttevika in the 1930s. From 1930, Wanny Woldstad from Tromsø and her partner Anders Sæterdal spent 5 subsequent winters here. During two years, they were accompanied by Wanny’s two teenage sons Alf and Bjørvik Jakobsen, then it was time for Anders’ two children Emilie and Frederik to join. So they were living there with 4 persons largely in one room for three long winters! 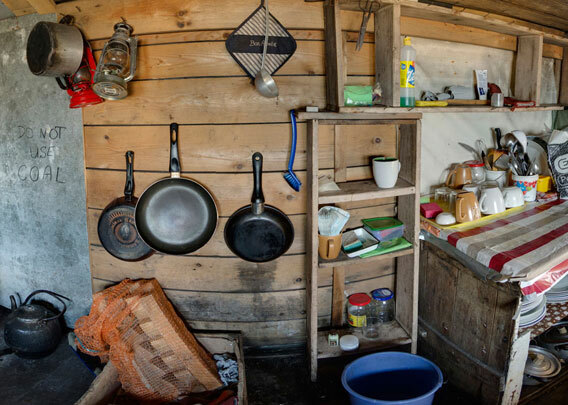 And in addition, even the dogs were allowed to live in the hut with them at times. On top of it all, sometimes the main room, which was the only one that was warm, had to be used to thaw up frozen polar bears for skinning and butchering, something that would take 2 or 3 days. It is easy to imagine that space was a scarse resource then! Wanny Woldstad joined Anders not as a housewife, but as an active hunter. She did a lot to keep things tidy inside, but she did just as much outside, controlling traps, hunting polar bears even in the dark period and joining even the longest and most dangerous trips. She was not afraid of anything and shared all duties of this business which was otherwise almost completely dominated by men. She is telling her story in her book Første kvinne som fangstmann på Svalbard. Being a good storyteller, she was famous in northern Norway, when she died in 1959 – not killed by an angry polar bear, but hit by a lorry not far from home. The time-honored hut in Hyttevika is still more or less regularly used, as it is just a good 12 km away from the Polish research station in Isbjørnhamna in Hornsund. The Polish scientists are there more or less regularly, both for research work and in their free time.